Posted on October 22, 2014 by Eddie L. Bolden, Jr. The plugged-in generation haphazardly taps away with headphones in their ears. The unique sounds of clacking, clunking, zinging, and the occasional pinging that used to be commonly associated with the art of prose have now fallen on deaf ears. Inside of his quiet work-space, an elderly man stands behind a brown counter. For the last thirty years, he has been in the midst of an everyday battle against technology and its rapid and ever-changing world. “It is not easy, but this is what I love to do,” said Sam Vasquez. Vasquez is the owner and shopkeeper of E.S. Business Machines Company, a repair shop located in the Morris Park section of the Bronx. 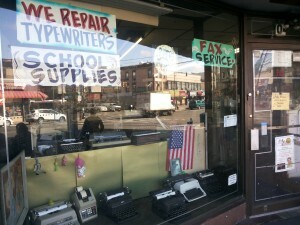 The shop specializes in the repair of classic typewriters. It also services antique cash registers and adding machines used in various pubs and restaurants. For almost three decades, E.S. Business Machines Company has operated in the heart of the northeast Bronx. However, its roots trace back to another part of New York City. Born in 1937, Vasquez moved from Puerto Rico to the Bronx when he was 17. 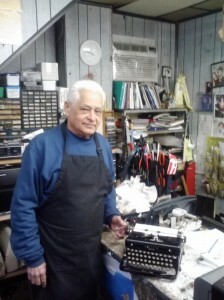 As a high school student, Vasquez was drawn to the science of typewriters and eventually began to work as a mechanic. 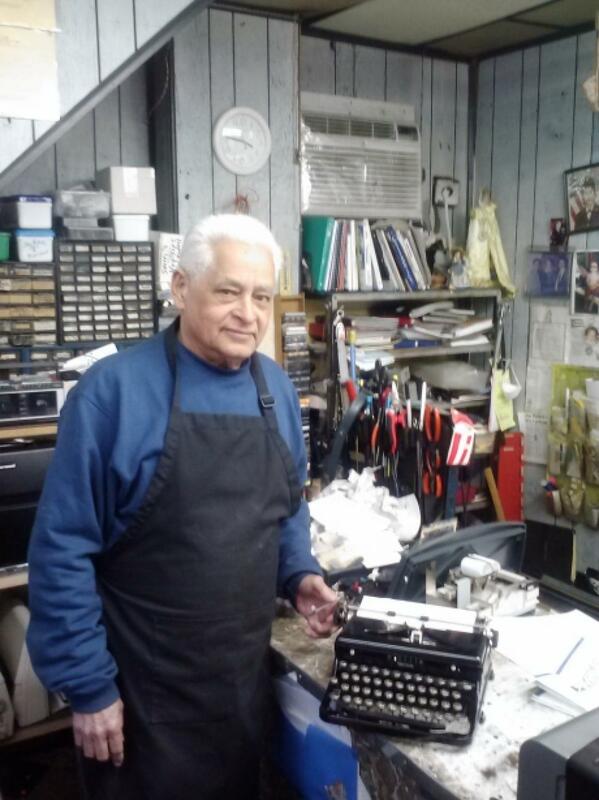 repair them, but I love to repair typewriters.” Vasquez has repaired typewriters for the past 58 years, a passion of his that he has yet to lose. The price of a repair was determined by the amount of service required on a typewriter. In some instances, service was priced at $10 for a ribbon repair or $30 for a cleaning. Other times, typewriters were dropped and broken beyond repair. These typewriters could not be replaced because of their rarity. Alone in the store, Vasquez often sat behind a cluttered workbench. Pictures of family members took up permanent space on the walls above him. 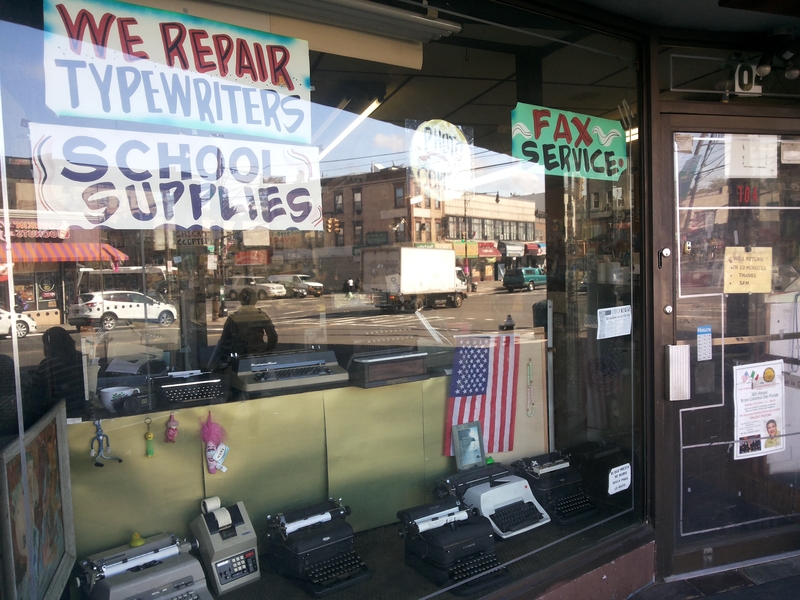 Vintage typewriters, cash registers and adding machines displayed in the window like exhibits in a museum. Stationary supplies and other machinery were scattered throughout the shop. From time to time, a curious set of eyes peered from the other side of the storefront’s window. Those same curious individuals and the countless other beneficiaries of the technological era are the shop’s biggest competitors. They are the new generation of people who have reaped the benefits of technology’s exuberant gifts. As personal computers became more accessible, the demand for typewriters steadily decreased. Along Morris Park Avenue, E.S. Business Machines Company stands out as the only business of its kind. Intimate cafes, restaurants, and convenience stores line the strip, but none have their own particular niche such as E.S. Business Machines Company. As the years passed, E.S. Business Machines Company began to feel the effects of advancing technology. However, Vasquez did not view the change in technology as a bad thing. “It’s amazing what all of these computers can do,” said Vasquez He cited smart-phones, tablets, and personal computers as all incredible innovations through time. There was a pause and Vasquez once again began to stare outside of the storefront window. Presumably, his mind focused on the future of both himself and the repair shop. Today, the rent for businesses along Morris Park varies from $1500, $2000, and $2500. The price of rent is based on the location and size of the store. E.S. Business Machines Company’s location is in the shopping district of White Plains Road & Morris Park Avenue, an extremely busy intersection with a lot of pedestrian foot traffic. E.S. 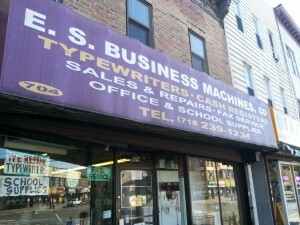 Business Machines Company remains a premier destination in the Bronx for young and upcoming writers who wanted to experience writing on a different tool such as a typewriter. 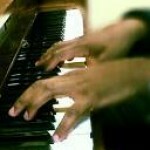 This entry was posted in Small Business by Eddie L. Bolden, Jr.. Bookmark the permalink. About Eddie L. Bolden, Jr. I want to go over the last few paragraphs with you because the order still is mixed up. Group all those paragraphs that relate to repairs in a row. Then, group all of those that speak to new technology and the future of his shop. Right now, they are still mixed together.